Nothing has been announced at this point, but we would be absolutely shocked if Philips Hue didn’t offer its customary discounts this year for Black Friday 2018. That means modest (but much appreciated!) 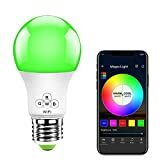 discounts on its most popular smart lighting products, and that typically includes $10 off the company’s $50 A19 multicolor bulb. $10 in savings is certainly helpful since the company’s bulbs are so expensive, but there’s another option you should consider instead. The MagicLight WiFi A19 Smart Light Bulb supports 16 million different colors just like the Philips Hue bulb. It can also be controlled by an app, by Alexa, or by a smart home hub just like Philips Hue. What’s the biggest difference? MagicLight’s bulb is on sale right now for just $17! Colors Settings: Personalize your lights with a color palette of over 16 million colors including warm white and cool white. Camera Mode: Use the camera feature to auto select colors as your see them, or capture a color in real time and it will display on your MagicLight. Dynamic & Customs: 20 Pre programmed color modes to kick start your party, and you can also create your own modes. Great for Christmas color selections. Night-Light: The Night-Light function helps with relaxation while also assisting wtih quality sleeping time. Mic Function: You can use this mode to sync sounds such as Spotify or Pandora and instantiously the sounds will dance with your MagicLight. Remotely Control: You can control your MagicLight from anywhere in the world.